We know that many parents enjoy squeezing in one last lunch with their student(s) before school is out, so we wanted to be sure to let everyone know that the last day we are able to accommodate lunch visitors will be Thursday, May 26. With parties beginning on May 27, parking becomes a big issue. Thank you for your understanding. 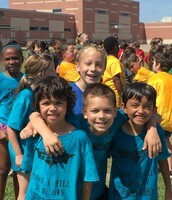 Our Pre-K through 4th grades will have their end of year parties on Wednesday, June 1. The parties will take place in the classroom. A snack and an awards program will take place during this time. All parents are invited to attend, and RSVP forms will be going home soon. Students will have an extra fun day, as they will get to celebrate during large group time with inflatables. The large group time if for the students only. CFISD requested and received a waiver for time that was missed due to the flooding. We are required to make up one of the five days, which will now take place on our inclement weather day of June 2. Report cards will be distributed on this last day (not sooner). 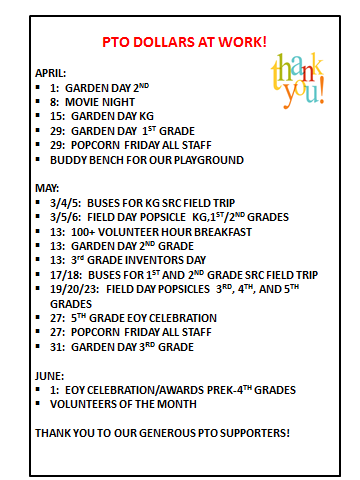 Our end of year parties for PPCD, PK-4 will still take place on June 1. As the end of the school year approaches, we would like to remind you to pick up any medications you provided to the school clinic this year. According to CFISD Board policy FFAC (local), medications must be retrieved from the clinic by a parent/guardian or designated responsible adult. Please make arrangements to pick-up your student’s medications by Thursday, June 2, 2016 no later than 4:00 p.m.
Any medication that is not picked up by June 2nd at 4:00p.m. will be disposed of according to CFISD policy. Congratulations to Mrs. Chiasson, our nurse, for being recognized by the Houston Chronicle as one of the top school nurses in the Houston area. Mrs. Chiasson was recognized at a luncheon hosted by the Chronicle just yesterday. It is always bittersweet to announce that one of our staff members is retiring. 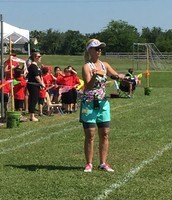 Mrs. Duderstadt has made the decision to retire at the end of this school year after dedicating her career to teaching PPCD. 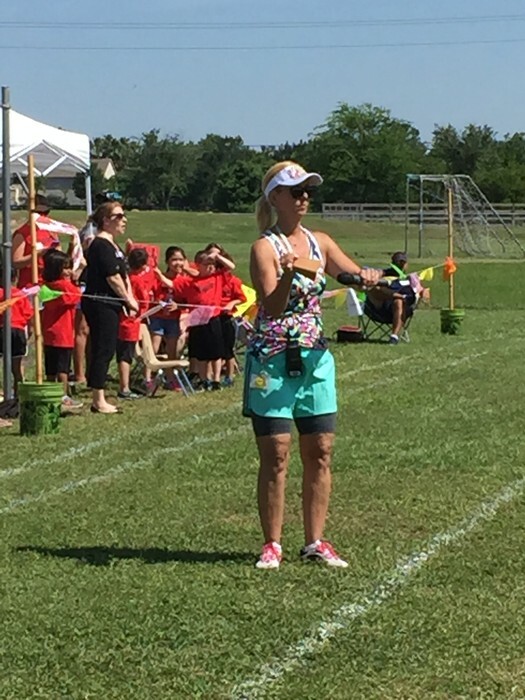 We will miss "Mrs. D" very much, but we wish her well as she begins this next journey in her life. Our precious third grade teacher, Ms. Hurt, is getting married this weekend! We can't wait to welcome her back next week. Thank you to all of our Robison families for a very successful Book Fair. We appreciate your support! This summer our students will have the opportunity to participate in our Summer Olympics Reading Challenge. Students will have the opportunity to earn a Bronze, Silver, or Gold medals for the number of minutes they read over the summer. More information will be coming home at the end of May. 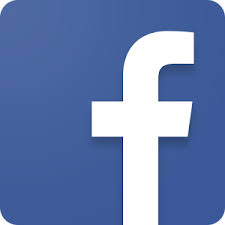 Be sure to Like our Library Facebook Page. It can be found by searching Robison Elementary Library on Facebook. New information will be posted throughout the summer. The Library will be open for Summer Checkout. Dates and times will be coming soon! Thank you to our students, parents, and staff for their contributions to the flood relief drive sponsored by Cy-Hope. 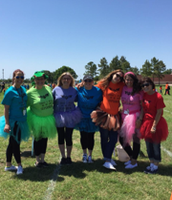 Because of your donatios, families in CFISD will benefit! Robison Rockets will be kicking off the month of May with kindness. All month, teachers and staff will be catching students being kind. If a student is caught being kind, they will be given a link to put on the “kindness chain” in the hallway. The link will have the student’s name on it and a brief description of their kind act. Currently, each grade level has a “kindness chain” started. Our hope is that all grade levels are able to connect their chains to the next grade level. This chain will serve as a reminder to all of the kind things happening at Robison each and every day. Let’s wrap this building with “kindess”, Rockets. The window for ordering will be open later this week through June 26! 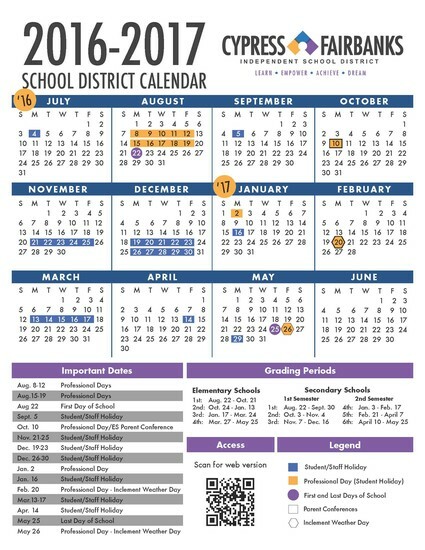 Be sure to order your child’s supplies for NEXT year’s grade level. Extra packets will not be ordered. 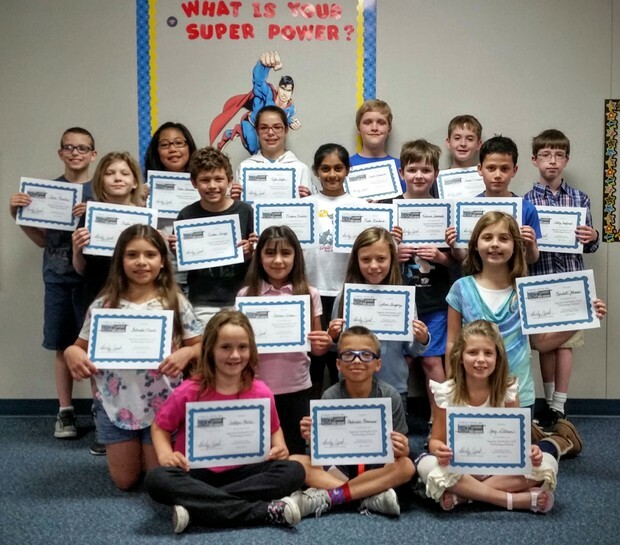 Congrats to Our Tech Fest Participants! Inventors Day has been rescheduled for Friday, May 13th. I appreciate your patience as we worked through rescheduling this fun event. Friday will be a full day! To help prepare, we will set up as much as possible on Thursday, May 12th at 4:00. Our PreK-4th End of Year Party will remain on Wednesday, June 1. During large group for these grade levels, the kids will get to have fun on inflatables and enjoy a Kona Ice Snow Cone. This large group time is for Robison students only, we cannot accommodate younger siblings for safety concerns. No middle or high school aged siblings are allowed on campus this day per CFISD policy. Only parents volunteering will be permitted during large group since we do not have space for parent visitors. More information will come out for parent volunteer sign up for the large group time. Also on June 1, there will be the final awards ceremony in the classroom. Parents will be able to be in the classroom for the awards. Looks for an awards ceremony schedule soon. Robison wants to send you a loud shout out "THANK YOU" for volunteering in the classrooms and teaching our kids about the economy and the world. You are all remarkable individuals and we appreciate you so very much!! 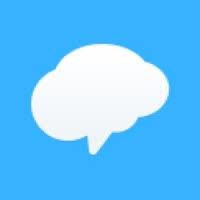 Below are Sign Up Genius links to help out with your 5th graders last elementary school party on Friday, May 27. Volunteers are needed to make this a memorable & successful event. Only volunteers will be allowed at the event, so consider signing up to help out. 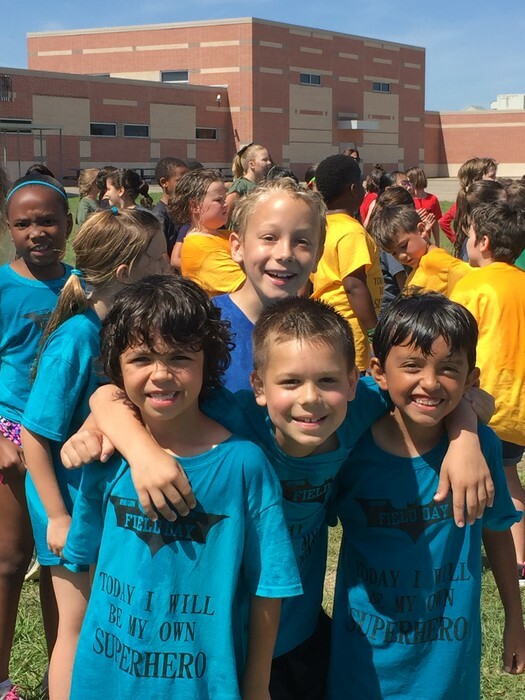 For safety reasons, no younger siblings are permitted at the party, and per CFISD policy, no middle or high school aged siblings are allowed on campus on party days. For more information or if you have any questions, you may contact Kim Worchesik at kimberlyworchesik@gmail.com or Shannon Bickham at shannonbickham3@gmail.com. 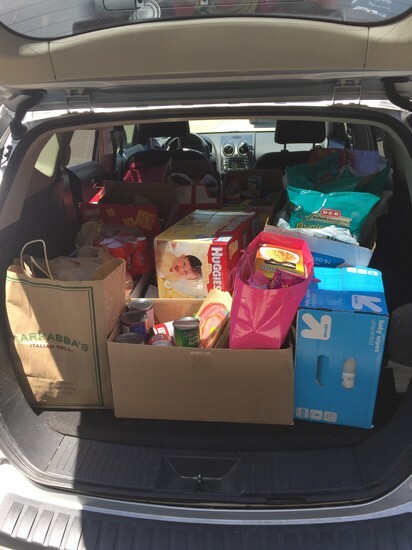 If you aren't able to physically help out, please consider donating food items. We need all food donations at the school by noon on Thursday, May 26. See food donation sign up for more details and items needed. Thank you! 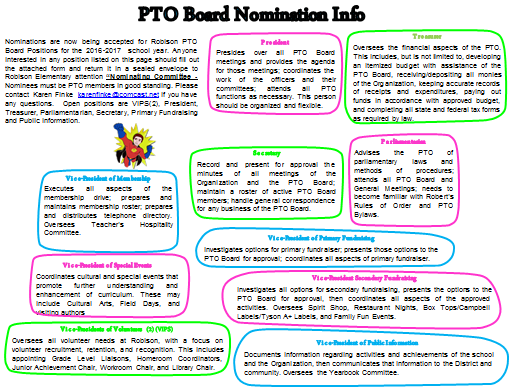 We are still taking applications for PTO Board positions for 2016-2017. The open positions are Treasurer, Secretary, Primary Fundraising, Public Information, Parliamentarian, and VIPS. Please see below for the explanation of these offices and the nomination application. You can nominate yourself or someone else. 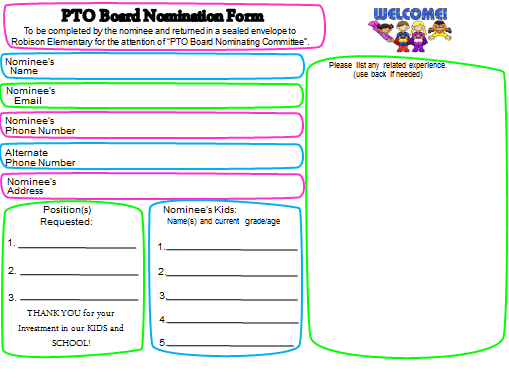 If you have any questions, you may contact Gina Bahr gbarh@comcast.net or Karen Finke karenfinke@comcast.net Having a fully slated Board of PTO officers enables us to provide the best “extras” for our Robison students and staff. Please consider helping in this capacity. WOW, the end of the year is coming to a end, So do not miss out, buy your yearbook while they last! We have about 100 left to sell! 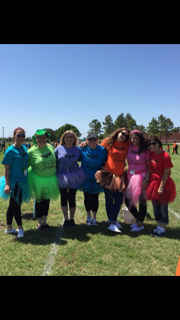 As I have wrapped up my 7th and final yearbook for our wonderful Robison Rockets, I want to thank Alicia Martinez, Kristen Jorden, Margaret Zwerneman, and Amanda McCumber for helping me over the past few years. I could not have done this without you wonderful ladies! Also thank you to the amazing staff for always being so accommodating, helpful and supportive over the years. I have truly been blessed to get to hang out with you'll! I will never forget the little smiles that I captured over the years! 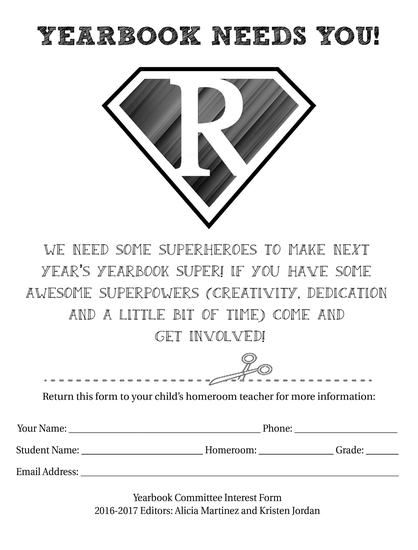 We are planning next year and we are looking for people to help out with the yearbook. If you like taking pictures, digital scrapbooking, or want to help with the order input, then we have a place for you to help out! 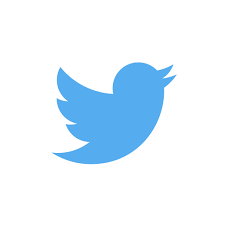 This is a wonderful experience! Please let me know! 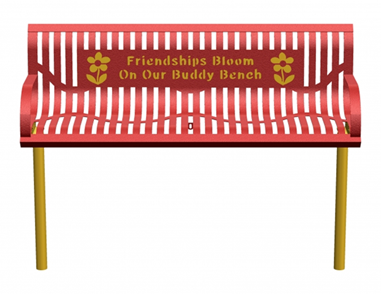 Coming Soon to Our Playground--A Buddy Bench!